Spider-Man is easily one of the most beloved characters of all time. Since his introduction by Stan Lee and Steve Ditko (with Jack Kirby doing some early sketch work) in August of 1962, the web-slinging kid has seen more plot threads and storylines than you can shake a stick at, but none are so beloved and well known as Peter Parker’s origin story. Thankfully, the team at Insomniac wanted to push a little further into less-explored territory, giving us a game that lets us play as an older, more seasoned superhero, and they invited the folks at Titan Books to provide a look behind the scenes. Marvel Spider-Man: The Art of the Game has two forwards and a large introduction section, with good reason. The first forward is from Bill Rosemann, Executive Creative Director of Marvel Games. Unlike most book forwards, this one is a highly personal one that talks extensively about why Spider-Man is special to him, and how this character has evolved over time into the one we know today. It also contains a smile-inducing postscript that encourages the reader to pick up a great chapter in The Amazing Spider-Man graphic novel arc — “The Kid Who Loves Spider-Man”, coupled with the best advice he could give; encouraging young kids to read and fall in love with comics, just like we all did. Peter Parker’s alternate looks were pretty good, but the final take fits the character best. The second forward for the book comes from Bryan Intihar, Creative Director at Insomniac Games. In it he provides a heartfelt and infectious excitement about the opportunity to build on such a beloved property. His genuine excitement practically leaps off the page as we get to share in his enthusiasm in the remainder of the book. It’s a short forward, but he frequently jumps in on other sections of the book, so fret not — he has plenty to say. Titan Books has once again brought in veteran book curator Paul Davies to provide the backstory and connective tissue to bring this book to life, starting with a huge introductory section that echoes my sentiment and (now-alleviated) fears for this property. Having reviewed quite a few Spider-Man titles over the years, I always found them painfully shackled by the restrictions of the intellectual property owners — and yes, that word is plural. Having Sony and Marvel locked in a perpetual battle over the property has hamstrung every game that has come before this one, but recent developments with Spider-Man has had a freeing effect. This sentiment is echoed by Insomniac’s Creative Director Bryan Intihar who calls it “one of the best experiences of my entire life,” stating that Marvel simply wanted to help make the best Spider-Man game at the highest possible quality without dictating how that happens, or what story threads the team would need to pull. It’s nice to see things behind the curtain like this, and refreshing to hear that it’s a more comfortable collaborative process than we might initially believe. It’s not all sunshine and rainbows in New York with Spidey’s villains around. 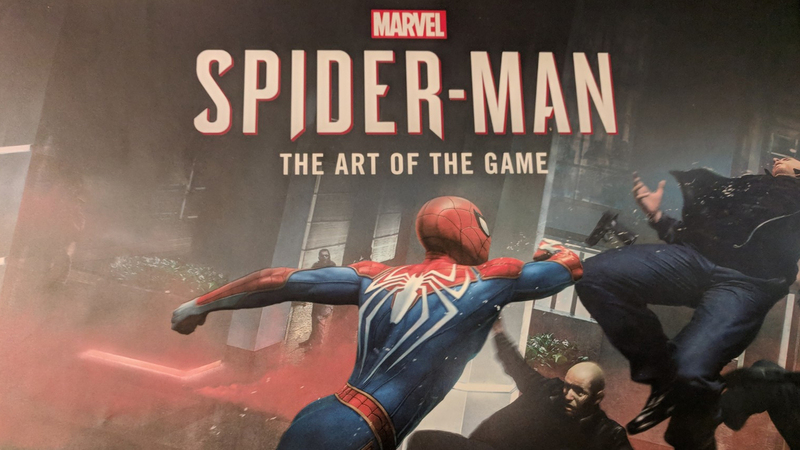 The layout of Marvel Spider-Man: The Art of the Game is split into three sections: City of Hope, City of Fear, and City of War. Be forewarned, true believer, that this book (but not this review) contains spoilers for the game storyline. Insomniac’s Spider-Man game is one that tells the story of a more mature Spider-Man, and as a result, Art Director Jacinda Chew set out to create a Spider-Man that would fall somewhere between that of a young man and a muscle-bound athletic football player, settling in on more of a well-oiled fighter’s physique. In the first few pages of this section, Chew and her team shows off some of these early designs, with full two-page full color layouts of the classic Spider-Man costume and build. Moving further into the animation theory of the game, Lead Character artist Gavin Goulden goes into a great amount of detail regarding the way that they ensured that Spider-Man is able to move smoothly in ways that would normally distort a character model horribly. The next section of this book is my absolute favorite — the modeling of the various characters that you’ll encounter throughout the course of the storyline, starting with an early unused concept of Peter Parker himself. Looking slightly more like a blend of Sam Winchester from Supernatural and Bo Duke from The Dukes of Hazzard, this character serves as the guiding star for the team to build this expansive universe. Moving on from Peter, we also get to see alternate looks for Detective Watanabe, several villains and their henchmen, and many of the locations that you’ll frequent in the game, including Peter’s frequently-messy apartment. One of the biggest changes in character design was reserved for Aunt May. There are two dozen designs for her, many of them wildly different than the last as the team tried out all of the different ways they could express the character in a way that would match the tone of the story Insomniac was creating. Aunt May went through a lot of iterations during design. There are two things that immediately come to mind when you think of New York — massive buildings, and massive billboards. Further into the book, the Insomniac team showcases how they approached both, creating a believable city full of advertising that blends in, but is believable enough to be real — I’m a fan of Swillco and its “out of this world flavor”. If there’s one drawback to this book, it’s that the team didn’t spend much time on the excellent costumes in the game. There are a whopping 26 costumes to unlock in the game, but only a very small handful are shown. I feel like the team at Titan and Insomniac could have given us some additional looks at these awesome costumes and any concepts that lead to their final designs. It’s a minor nit, but one that could have been a fantastic addition. These two costumes, and the classic Spider-Man rig, are the only ones in the book. About half way through the game, some major events occur that changes the city and the tone of the game. I won’t reveal that, obviously, but it does introduce a whole host of main characters and support troops to make life difficult for Spider-Man. Once again, Insomniac took established characters and put their own spin on them, creating new versions of these classic characters that would be welcome on the pages of any comic book as they are in this book, and in the game. Without giving away entirely too much, this happens again when things go from bad to worse in the third act of the game and this book — City of War. In this section, Spider-Man will be truly tested by the beasts unleashed here. Beyond the unsavory suspects also lies some fantastic artwork that you’ll find throughout the city, balancing out the monsters with beautiful graffiti of such subjects as The Golden Monkey, traditional chinese masks and fu dogs, a few takes on Japanese artwork, and even a few water colors, neo-traditional, and some modern art. The book concludes with a section that I can’t open as I’ve not finished the game — The Final Showdown. I showed it to a friend who has and he said “Yep…that’s…” and that’s as far as he got before I told him to shut up. I can only assume he was going to say it was awesome. This is one of the best books I’ve seen from Titan Books. It’s filled with a lot of personal anecdotes from the art team, Insomniac’s creative crew, and more full-page color spreads than you’d normally get in any behind-the-scenes look at the creative process. It’s a fantastic addition for any Spidey fan, and a great peek at how this Amazing game came together.